Thanks to a recommendation from Walker Books Australia's wonderful Leonie Jordan, I recently discovered Violet Mackerel's Brilliant Plot. It was written by Anna Branford, illustrated by Sarah Davis and published by Walker Books in 2010. Violet Mackerel thinks she would QUITE LIKE to own the blue china bird at the Saturday markets. This is not just a SILLY WISH. It is instead the start of a VERY IMPORTANT idea. But what she needs is a PLOT. A BRILLIANT plot. 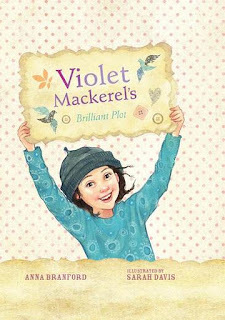 Introducing readers to a new warm and loveable character, Violet Mackerel’s Brilliant Plot is a story not to be missed. I LOVED Violet. I especially appreciated her theory of finding small things. She is just the sort of character kids will relate to - quirky, enthusiastic, and creative. Branford perfectly captures Violet's voice and shows us the way her mind works. I was in a constant ripple of giggles as I read of her exploits, and looked at the world through her eyes. Humour is hard to write well, and Branford does it brilliantly. Interestingly, Violet Mackerel's Brilliant Plot was written in the present tense, which works well, giving a sense of immediacy to the novel. The hardback edition is robust, and perfectly formatted for kids who are delving into junior novels or chapter books. Davis' black and white sketches are gorgeous, and complement the text beautifully. They are soft but detailed, I'm guessing pencil sketches with watercolour. Davis really captures so much personality with just a few lines that we gain insight into what is going on in Violet's head. Davis also gives us Violet's own sketches and captions, adding to our enjoyment of Violet's character. Violet Mackerel's Brilliant Plot is recommended for children aged 7+. I think it would be a perfect acquisition for libraries, as well as a great choice for kids who love series. They can follow up with Books 2 and 3, Violet Mackerel's Remarkable Recovery and Violet Mackerel's Natural Habitat. The books seem just right to use as a read-aloud for kids in Grades 2, 3 and 4, and Walker Books have again added value to them by including classroom ideas on their website. Violet even has her own website, where kids will enjoy reading more about Violet and downloading lots of interesting activity sheets. Check out other reviewers' opinions at Aussie Reviews, Kids Book Review, Kids' Book Capers, and My Book Corner. Oooo I'm glad you are a fan of Violet Mackerel too - we can't get enough of her here!! Thanks for the shout out! You're right about the illustrations from Sarah Davis too, they really do add value to the books. I think they are very welcome to children who are just expanding in to chapter books. Did you know a new one is out very shortly? Violet Mackerel's Personal Space ... too excited!! @Emma @ My Book Corner Thanks for letting me know, Emma - I'll look out for it for sure!